Evidence of the growing importance of online review sites like Yelp, TripAdvisor, Google, and Facebook is hard to ignore. According to research by ReviewTrackers, 49 percent of consumers always or often check online reviews, and Search Engine Land reports that 72 percent trust reviews as much as they do recommendations from friends and family. Reviews have also shaped search algorithms. And with Google explicitly indicating that reviews play a role in one of its three primary local search factors, an increasing number of marketers and local SEO professionals have been crafting strategic approaches to reviews in hopes of improving local SEO performance. One of the most prominent and therefore sought-after places in Google’s local search results is the “local pack”: a set of three highlighted Maps-based results (it used to have seven) featuring the most highly ranked businesses based on the factors that determine local ranking. 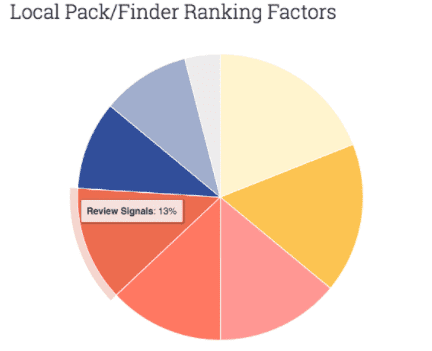 Google My Business signals (19%), link signals (17%), and on-Page signals (14%), review signals (13%) outrank behavioral signals, personalization, and social signals when it comes to local pack ranking factors. Online reviews are factored into organic local search rankings, too. 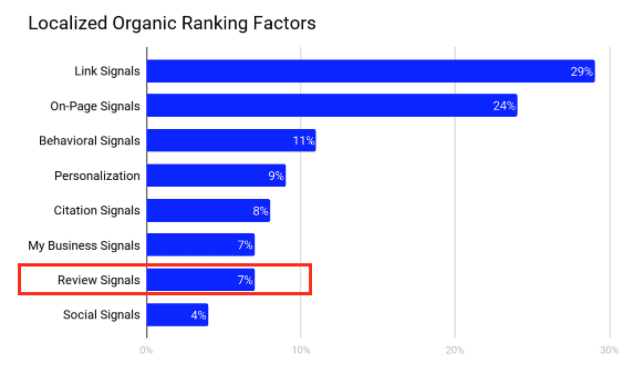 According to Moz’s report, review signals make up approximately 7 percent of what gets you listed in organic results — good for top 7, again ahead of social signals and closely behind traditional search factors like on-page and link signals. These findings demonstrate that the voice of the customer is louder than ever, and it resonates in the local SEO landscape, too. Marketers who actively manage online reviews and stay highly engaged with customers can therefore position themselves better in search. Even if a business hasn’t yet gotten into the local pack, high ratings and consistent positive feedback can still sway users to click and convert. With online reviews on the rise, marketers and search professionals also have the opportunity to harness massive amounts of customer-generated data in order to build winning brands and improve performance. Review diversity (i.e., reviews on many different sites). Simply put: if you’re getting a significant number (review quantity) of excellent reviews with high ratings and positive sentiment data (review quality) across multiple high-authority review platforms (review diversity), you stand a better chance of getting found (and getting clicked on) in local search results. Rating scores help boost your powers of persuasion. As probably the most identifiable, structured, and quantifiable review signal, your rating scores can easily persuade (or dissuade) searchers. Only 13 percent of consumers will consider buying from a business with a 1- or 2-star rating, according to Search Engine Land. When it comes to choosing restaurants, more than 1 in 3 diners wouldn’t eat below four stars. While not the only decisive factor, rating scores effectively serve as a useful and convenient source of information for when consumers are looking to find out more about a local business they’re not familiar with. Review quantity helps build credibility. Only 8 percent of consumers do not read online reviews, based on the aforementioned Search Engine Land report. Meanwhile, YouGov found that 53 percent read reviews to make sure they don’t get ripped off. It’s obvious that consumers today are actively seeking out online reviews in order to validate their purchase decisions. So find ways to increase your review quantity: the more reviews you have, the more credible your business looks. Review diversity broadens your social and digital footprint. Planting your flags across all relevant review platforms (including industry-specific ones) can help your citation-building efforts. More importantly, it expands your social and digital footprint, allowing your brand to become more visible on the sites and apps that consumers are using to find and rate local businesses. Review quality and sentiment boost brand reputation. It takes more than a fancy logo, a memorable slogan, or a cool trade name to build a great brand. To truly differentiate yourself from the competition, you must be able to build a rock-solid brand reputation. According to Sprout Social, 4 in 5 will reverse their purchase decisions after reading negative reviews. Meanwhile, YP found that 55 percent will not consider a business with negative reviews and ratings. Additionally, 27 percent will also voice their dissatisfaction when it comes to businesses with no testimonials, ratings, or reviews. Review velocity and freshness help you stay relevant. Be honest: would you or any consumer trust a Google or TripAdvisor review that was posted 4 or 5 years ago? Even if the review describes a restaurant as offering the “tastiest sushi burrito in the world ever,” it becomes less convincing by the day, week, month, and year. A ReviewTrackers report details how the shelf life of online reviews may be shorter than expected, with 69 percent of consumers believing that reviews older than 3 months are no longer relevant. 15 percent, meanwhile, believe that the only relevant reviews are the ones written within the last 2 weeks. Also worth considering: review velocity and freshness can improve your content quality and SEO performance, especially when your strategy includes incorporating reviews into your website and business pages. AdWeek suggests that 800 words of review text can make up as much as 70 percent of fresh content for your page, which search engines will then reward with higher search results. Marketers and local SEO professionals should, therefore, aim not only for great reviews, but also for great new reviews, generated at a pace that’s consistent with and relevant to the needs and expectations of searchers. Not only do online reviews influence consumer behavior and brand reputation; they also make an impact on local search rankings. By investing time and effort into executing your online review management strategy, you can boost your search visibility, snag more clicks, and gain the trust of today’s review-reading, review-writing consumers. Chris Campbell is the founder and CEO of ReviewTrackers, a Chicago-headquartered software company that helps over 30,000+ businesses measure and transform their customer experience across 85+ review sites. A digital marketing veteran and brand strategist with extensive entrepreneurial experience, Chris founded ReviewTrackers in 2012 to help businesses and brands make data-driven decisions about what their customers truly need and want.